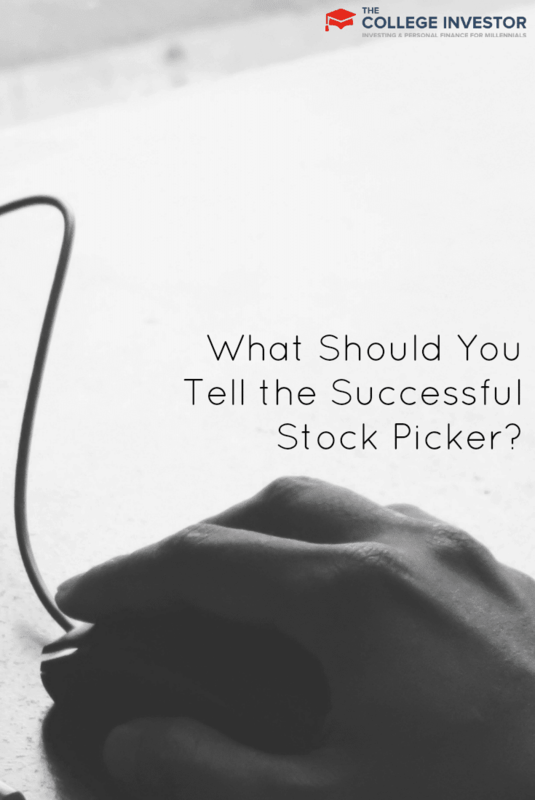 What Should You Tell the Successful Stock Picker? Home » What Should You Tell the Successful Stock Picker? How many times have you been tempted to give up on index funds and go for it by investing in an individual stock? Well, if you’re reading this blog or any personal finance blog for that matter, the answer is probably not many. It doesn’t take much research to quickly see that it’s pretty tough to consistently pick winning stocks. All those Wall Street guys do it for a living and most of them can’t beat the market after fees so why would someone who part-times as a blogger and volleyball coach think he can do any better (that’s me!)? But alas, recent market performance has created a new generation of successful stock pickers. What they fail to realize is that everyone, no matter what strategy they’ve been using, has made a lot of money over the past couple years. Grounded investors should draw from past experiences though and remember that this is not the time to get greedy. Just because an asset class is performing well doesn’t mean it will continue to do so. The inspiration for this article came from a friend at work who is always talking to me about his two babies. And by babies I mean his investments in Chipotle (CMG) and Apple (AAPL). To his credit, he does make very good money at his day job and is a smart saver and spender. He and his wife drive reasonable cars and live in a nice modest home. From what he tells me, the total investment for both stocks combined seems to be in the range of $50,000. Since his strategy worked so well, I don’t know if there’s anything I can tell him to change his mind about stock picking but I still like to try. When people tell me how well their individual stocks have performed, the first thing I always ask is: How has the market performed during that same period? In a bull market especially, people get caught up with how well their stocks are doing but forget to compare it to a benchmark. What would you say if I told you I’ve invested in a stock that’s returned 17% annually for the past three years? Would you want in? Believe it or not, that is the exact return of a low-cost 500 index fund over the past three years. If the stock in question has done well and outperformed the average of the total U.S. market, the next thing I’ll do is compare it to a low-cost index fund in its respective sector. If the company is a technology company like Apple, then I would compare it to an index fund that tracks large technology stocks. Although outliers do exist, if you feel the need to tilt your portfolio toward a certain sector it’s best done with an index fund since it will eliminate uncompensated risk. Are You Smarter Than the Professionals? Imagine you are a full-time professional engineer. You went to school for four years and graduated with an above average GPA and started working for a large firm where you did very well and were one of the best and brightest. One day, an intern starts working and proclaims that he is a better engineer than you even though he has very little experience and no formal training. He’s been spending his weekends reading textbooks and using Google to learn all about engineering. Even though that situation seems pretty ludicrous, isn’t it exactly what we see with your average stock picker? Stock pickers may spend a little time here and there reading over some company’s financial documents and comparing a few P/E ratios, but they will always be amateurs at best. They are competing against people who studied finance in school, work for companies with thousands of resources, and have access to some of the best information in the business. And the sad thing is, only a handful of those professionals will ever consistently beat the market. I rarely try to convince stock pickers of these facts since it generally takes firsthand experience to alter one’s investing behavior. Although you won’t ever see Chipotle-like returns by investing in index stocks you also won’t ever see Blockbuster-like (get it?) losses. I know that there are a lot of aspects of the stock market that are beyond my control, so instead of trying to predict them I like to focus on the things that I can control. When you’re young, rate of savings is so much more important than anything else. When you’re older, fees and allocation will dominate your returns. So why not focus on that instead of gambling on a hunch? Readers, do you know anyone that’s a ‘stock picker’ similar to what I describe? What would you tell them if they had amazing results and asked you what’s so bad about investing in individual stocks? Harry Campbell is a staff writer for the College Investor and runs his own personal finance blog at Your PF Pro where he talks about everything from saving money at Chipotle to asset allocation for retirement. Harry currently resides in San Diego, CA and also works full time as an aerospace engineer and part time as a club volleyball coach. Not to take anything away from you coworker, but he picked 2 stocks! How many mistakes has he made? If the answer is none, I consider him to be lucky. I can find a few stocks I picked that did that well or even better, but not all my picks do that well. It is one of the reasons I invest in mutual funds. First I’ll say nice picks. Can’t argue with those returns. Sadly, I have experience with both of those stocks, but I’m on the other side. I was eating Chipotle quite frequently so I jumped in around the IPO, I jumped out a soon after to lock in a quick profit. We saw what happened next. Apple I jumped in a few years ago and got taken out by the flash crash. I bit the bullet and went back in a few years later to capitalize on the iPhone 5 craze only to stomach a 40% drop from the top. Your friend is lucky to have those two babies. If he is done trading, looks like he really beat the market. But if he decides to put more funds to work. One day, he’ll be on the wrong side of the trade and without a proper plan in place, he won’t be so lucky. Thanks for your honesty, I hope he realizes how lucky he got before he tries to do it again. But I think since he did so well the first time around he probably thinks that he’s pretty good at stock picking so he’s likely to try again and the results probably won’t be to good. Your co-worker got a great idea to pick 2 stocks. Such a genius man! It’s risky in investing in stocks but it’s worth it when you invested in a great company. Yea I understand the temptation and when it works, it works. But when it doesn’t, it doesn’t!